It&apos;s easy to grow disillusioned in the face of so many grim statistics and pessimistic forecasts about the ramifications of the West&apos;s relationship with its water supply. But, as with so many of our challenges, the biggest barrier, according to international water expert Peter Gleick, is the need to overcome antiquated — in this case, 20th-century — water conservation thinking. As Gleick has written and lectured about frequently, the philosophy of water managers during the last century was, "Whatever we need, we&apos;ll build it." During those decades of unbridled industrial expansion, there was little impetus to consider issues such as population, zoning, residential planning and home design. The good news is that for all the negative talk — whether it&apos;s the strained relations between urban areas and agriculture or the indiscriminate placement of boggy golf courses in semi-deserts — there are signs that a paradigm shift is occurring. One example is the growing interest in alternatives such as reclaimed water. "We used to think of waste water as a liability," Gleick says; "now, it&apos;s considered an asset." For example, in Tucson, 700 single-family homes, 39 parks and 52 schools, including the University of Arizona, irrigate with reclaimed water. In addition, agricultural production and income have both continued to rise, even though irrigated land in the West is no longer expanding. But perhaps the most hopeful piece of evidence that we&apos;re already heading down a different path is the decrease in per-capita water use in big Western cities. Gleick says that during the past 30 years, Los Angeles and most of the major urban areas have been functioning with less water, yet the population and the economy have continued to grow. That&apos;s not to say water managers and residents can rest easy. 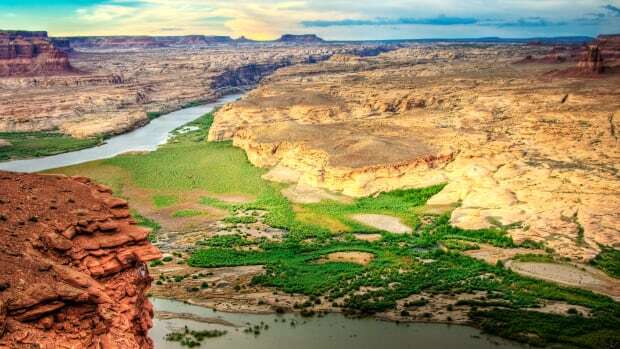 Much work remains, but a sensible approach would consider the four strategies outlined in Gleick&apos;s "roadmap" for sustainable water resources in the Southwest. The first, rethinking the water supply issues, involves, as he writes, "sources of water that were previously ignored or unusable." This includes the reuse of treated waste water, which the town of Prescott Valley, Ariz., has been using for many years to irrigate its golf courses and recharge groundwater aquifers. And in a first for nuclear power plants, the region&apos;s Palo Verde Nuclear Generating Station is capitalizing on reclaimed water for its cooling system. There&apos;s also a new, old idea: desalination. Further east, El Paso, Texas, recently built the largest inland brackish water-desalination plant in the world, increasing the availability of fresh water to the city by 25 percent. Glen MacDonald, director of the UCLA Institute of the Environment and Sustainability, says this is a more practical, affordable approach than conventional desalination using seawater, since brackish water is less saline. In any case, as with peak oil, "peak water," as Gleick terms it, is becoming increasingly hard to procure, meaning such expensive alternatives start to make more sense. Rethinking water demand and water conservation is the second strategy he advocates. As mentioned earlier, water districts have made great strides in efficiency without sacrificing economic productivity. One encouraging statistic revealed in Gleick&apos;s paper: The amount of water required to make steel has dropped from 200 tons of water per ton in the 1930s to just three in today&apos;s most efficient plants. But Big Ag is lagging behind. Nearly half of all crops in California are still grown using wasteful flood irrigation. The good news is that there&apos;s a great deal of room for improvement through relatively simple steps, such as converting to drip irrigation and micro-sprinklers. Arizona State University ecologist John Sabo takes this a step further, advocating increased farming on the Southern California coast, with its more temperate climate. "Why are we growing so much corn in the Midwest?" he asks. "Why can&apos;t we grow vegetables with more nutritional value in water-rich places like the Midwest? Scientists need to put those possibilities on the table so politicians and economists can debate whether they&apos;re realistic in the market." This brings us to Gleick&apos;s third strategy: improving institutional management. Flowing water does not respect state boundaries, creating friction between places like Nevada and Utah, which share groundwater basins. "New arrangements, especially in terms of improved clarity of federal/state responsibilities, can reduce pressures on water," he writes. Currently, more than 20 different federal agencies share responsibility for an array of water issues. And beyond consolidating water management is the need to quantify water use. Not all farmers are required to install water meters, leaving agencies with a poor understanding of how much agricultural water is being consumed. MacDonald asks, "Are we using the most efficient irrigation for crops? And are we growing the best crops for economic payback or food security or wise use of water? That&apos;s hard to know without sufficient water monitoring." Finally, integrating climate change will need to be part of any solution. The crises previously discussed will only be exacerbated by decreased snowmelt, increased drought and erratic weather patterns. As Gleick warns, "the hydrologic cycle is the climate cycle." So, while reducing greenhouse emissions won&apos;t prevent climate change, it can slow down its impact and reduce its severity. This is why California&apos;s Department of Water Resources includes integrating climate change into its short- and long-term planning, and an Oregon bill calls for "adaptation plans related to Climate Change." At the federal level, some awareness has been fostered by the year-old WaterSMART program. "The federal government&apos;s existing water policies and programs simply aren&apos;t built for 21st-century pressures on water supplies," U.S. Interior Secretary Ken Salazar said in announcing WaterSMART (which stands for Sustain and Manage America&apos;s Resources for Tomorrow). "Population growth. Climate change. Rising energy demands. Environmental needs. Aging infrastructure. Risks to drinking-water supplies. Those are just some of the challenges." For Sabo, the next step demands additional analysis by quantifying the critical regional and continental trade offs between water and carbon footprints of agriculture and industry. "We need to assemble a team with carbon footprint, transportation, farming, and industrial lifecycle experts who can design incentives for industry and agriculture to best minimize the country&apos;s carbon-water footprint," he says. "Though it&apos;s a monumental task, it will put solutions on the table for politicians and economists to ponder and implement." And while Sabo agrees this will be a monumental task, it will yield solutions for politicians and economists to implement. As Marc Reisner wrote in the afterword to the revised edition of Cadillac Desert, "What it all boils down to is undoing the wrongs caused by earlier generations doing what they thought was right." 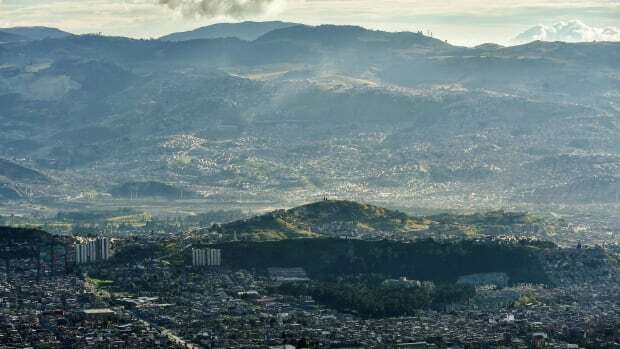 Due to farming, coal mining, and climate change, the Colombian capital's unique water ecosystem is disrupting the delicate balance that ensures water for the city. 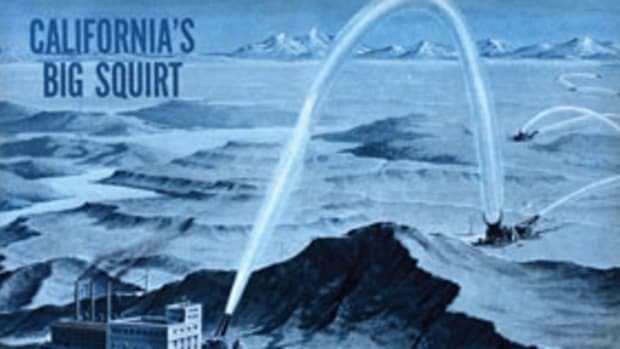 Who needs pipelines when massive hydro-cannons could blast water across California’s deserts?